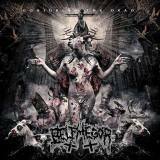 I claimed that Belphegor were becoming something of an institution in my review of 2011's Blood Magick Necromance, releasing albums on a regular basis to little acclaim from those not already fans of the band. Well, it's as if they were listening, taking three years rather than the usual one to release Conjuring the Dead, the longest time that the band have taken between albums since 2003's Lucifer Incestus. Does this mean a better written, more intense and epic album? Sort of, is the simplest answer. Conjuring the Dead follows in the footsteps of its rather good predecessor in shaking up what was in danger of being a tired formula, but doesn't quite do it as well, resulting in a fairly solid Belphegor album that will please fans without touching the heights of, say, 2006's Pestapokalypse VI. What we have here is a good blackened death album that plays to the band's strengths – hooks and atmosphere, Satan and perversion. It's an interesting listen, with plenty of sudden acoustic guitars and whispered vocals, full of songs that twist and turn and then throw blatantly catchy sections of moshpit riffage at you. And it mostly works, dragging you along gleefully through thirty-five-odd minutes of blackened death metal, glistening with the sheen of Rutanic production values, yet steeped in the filth of the underground. Belphegor have, after all, been around since 1992, and are nothing if not good at their job. For those new to the band, think Marduk plus Morbid Angel. Opener Gasmask Terror is a perfect example, blasting black metal that slowly changes into something more melodic and death-shaped as the track progresses, complete with widdly soloing that sadly doesn't last as long as it could. The title track's mid-paced groove is Morbid Angel-ic to a T, sliding nicely into grandiose Behemothic stomp, even a touch of Cradle of Filth-esque atmospheric keyboards working surprisingly well. From then on, things are slightly less impressive and the flaws begin to stack up - although the opening chug of In Death is perfectly headbangable the track does feel a bit melodeathy, Rex Tremendae Majestatis likes its acoustic moments but is a bit Belphegor-by-numbers, and so on. This can't help but drag the album down a little, which is a shame as there's some excellent writing otherwise, and those who listen with less harsh ears will enjoy Conjuring the Dead a lot. Every track here is ruthlessly precise, staying only as long as it needs to, with just one song passing the five-minute mark. This doesn't damage any of them, but considering the last couple of albums have had seven-minuters does suggest the band could have gone further without hurting the album. Still, three-and-a-half minute songs like Black Winged Torment, a furious rush of blackened filth with an epic edge, and Flesh Bones and Blood, a stomping crusher with Gojira-esque guitar squeals, are highly enjoyable. And the sub-three-minute Lucifer Take Her! is the best track on the album, rushing blackened riffs with horrific screams and growls making for a surprisingly eerie effect, continued on outro Pactum in Aeternum. Throw in a double-guest spot from Glen Benton and Attila Csihar on Legions of Destruction, and it feels churlish to complain too much; a solid album.